Download Free UltraVNC latest version now available from direct download link. Ultra VNC is a powerful, easy to use and free – remote pc access softwares – that can display the screen of another computer (via internet or network) on your own screen. 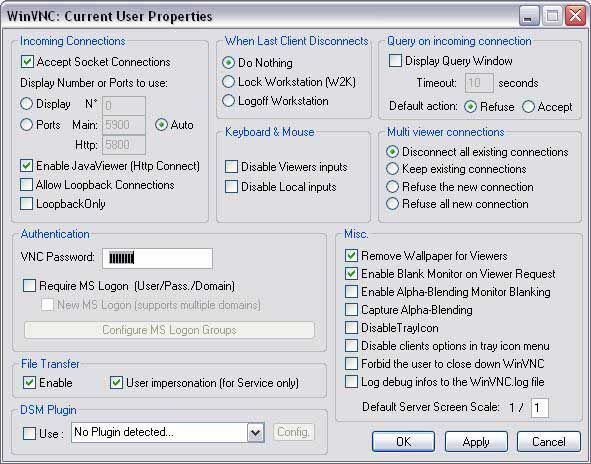 The program allows you to use your mouse and keyboard to control the other PC remotely. It means that you can work on a remote computer, as if you were sitting in front of it, right from your current location. Its embedded Java Viewer allows you to connect (and make File transfers) from a simple Web Browser on any system supporting Java (Linux, Mac OS…) to an Ultra VNC server. All VNCs Start from the one piece of source (See History of VNC), and should follow the RFB protocol for their communications (some rather loosley). This common start point means that most of the vnc flavours (variants) available today “usually” talk nicely together, allowing for easy cross platform desktop sharing to occur.